When you buy an Office 365 tenant you get the option to build a Public website within the SharePoint administration panel. Within SharePoint 2013 they have extended the options to build massive websites where you had to do a lot of customizations in SharePoint 2010. There are already many site available for example (http://www.motion10.nl ) but most off these websites are build on SharePoint 2013 on premise. This is all because building a public website within Office 365 has a lot of limitations. In this blog post I will try to list the limitations I know. If you find any other limitations or they have changed something on the Office 365 platform to make it work and I haven’t alter the blog post please add a comment or send me a email. 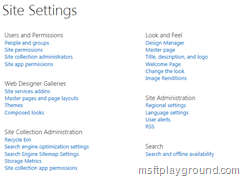 Multiple site settings screens are missing from the administration menu. Some of these pages can be accessed by the Url and some of them don’t even exist. Manage Site Collection Features: The link and the page are missing for a public website. Manage Site Features: The link and the page are missing for a public website. Site Content Types: The link and the page are missing for a public website. Site Columns: The links is missing for a public website you can access the page by using the following URL: [URL]/_layouts/15/mngfield.aspx. Solution Gallery: The links is missing for a public website you can access the page by using the following URL: [URL]/_catalogs/solutions/Forms/AllItems.aspx. Web Part Gallery: The links is missing for a public website you can access the page by using the following URL: [URL]/_catalogs/wp/Forms/AllItems.aspx. List Template Gallery: The links is missing for a public website you can access the page by using the following URL: [URL]/_catalogs/lt/Forms/AllItems.aspx. Term store management: The link and the page are missing for a public website. Many website on the internet are created in multiple languages. Looking at SharePoint you would then maybe would like to use Variations. In Office 365 variations cannot be used. As you can see on point 8 within the site settings section you are not able to access the Term Store Management. This also makes it that one off the amazing new features off SharePoint 2013 taxonomy-based navigation cannot be used on a Office 365 public website. Besides that more taxonomy based features do not work as for example the product catalog functionality. From the UI you cannot create a sub site. You will have to use SharePoint Designer in order to create a sub site. But even then you are not able to use every site template. In my situation I tried to create a Publishing Site and it got immediately deleted from my tenant. Content Search Web Part:One of the web parts you had to develop for previous version of SharePoint (At least I did) now came to SharePoint 2013 and that is the “Content Search Web Part”. This web part is not available on the public web site of Office 365. The Variations feature is available for SharePoint Online Enterprise (E1), SharePoint Online Enterprise (E3 & E4), SharePoint Online Midsized Business, SharePoint Server 2013 Enterprise. If you have another license, e.g. Small Business etc. then you don’t have that feature. Thanks for you comment. Things keep changing by the day. Thank you very much for this info. I am reading the book “Pro SharePoint 2013 Branding and Responsive Web Development” and decided to use the public facing office 365 web site to make the examples. 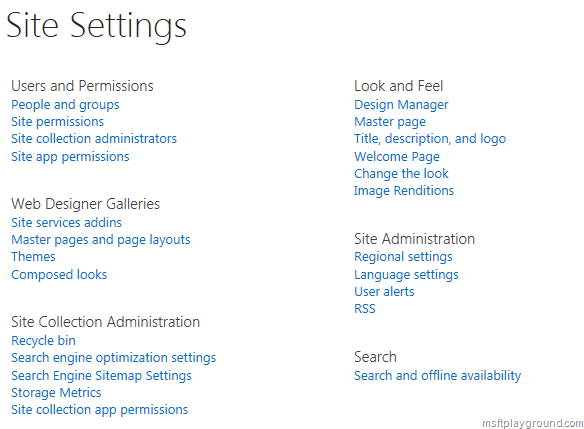 But I found I was missing some items in the site settings menu, including the ability to activate features. Being a novice in the Office 365 field I thought maybe some site administration must be done somewhere else. But now I know why. I will proceed with and internal web site. Thanks for this useful blog. I have a 8 year long background in Drupal and for me the public website In Office365/Sharepoint Online is quite a disappointment. The first thing I did was add uploading articles to a library and then installing the Table of Contents web part to display the list of its contents on my homepage. This is only possible on the Team site, on the website the TOC webpart can only display the contents of the Pages-library, not other libraries or folders inside the Pages-lib, which makes it pretty much useless and incomprehensible why the web part is available at all for a public site. Phone support is relatively good, but leaves a sour feeling if it takes two days to find out that my initial fears were justified. Is that True?? I put my doubt on it. I have been following many office 365 experts and they say public facing website in office 365 is not “that” limited. They ground is expanding on daily basis but anyways this is great article that certainly lit many bulbs and doubts in my mind. Yes it is true! It can be that certain things are not correct anymore as it is a really old post. A while back Microsoft also announced that it will not continue with de public facing websites in Office 365. If you have a old tenant you will still have the option for about 2 years I thought if you create a new tenant you will not have the option anymore.